Bunny Serlin reports that, when she retired as director of career counseling at Hamilton College, she and her second husband, Austin Briggs, a retired professor of English and Irish literature at Hamilton, decided to move to San Miguel de Allende, Mexico, a decision they have never regretted. “The large expat community is friendly, vital and international, and our Mexican hosts are warm and welcoming,” she writes. “The cultural life is rich, and opportunities to hear music — jazz, popular and classical — are abundant.” Bunny was elected vice president of the board for the Festival International de Música de Cámara, a vibrant chamber-music festival held in July and August. She and Austin love to travel and do so frequently to Europe and more recently to South America. On a recent trip to Florida for a James Joyce conference devoted to her husband’s specialty, Bunny reconnected with classmates Ronney Kushel Hellinger; Mike and Judy Leavitt Schatz, P’87; Adrienne Udis and Joel Rosenblatt, P’88; Sue Biberfeld and Steve Candell; and Susan Turitz Goldberg. Bunny hopes classmates will visit her in San Miguel. Dorothy Nelson resigned as a senior lecturer in English at the University of Massachusetts, Boston, in 2011 after 25 years of teaching writing and literature, including a semester at the University of New Mexico. She received her master’s in English from UMass Boston and studied with noted composition scholar Ann Berthoff. Her review of a book of poems by Bruce Weigl, “The Abundance of Nothing,” was published this year in Consequence Magazine, a journal addressing the culture and consequences of war. Dorothy’s book “The Dream of the Sea: Early Poems” was published in 2008. She writes, “My political awakening happened in the late 1960s. I threw myself into community journalism, and political and working-class activism. Jonathan Brickman and I had two wonderful sons but divorced after a few years. Jim Nelson and I were married in 1977. Our family: son Joshua and his wife, Amy, and their two children, Nathan and Edith; son Raphael and his wife, Leila, and their two children, Isaac and Samuel; and son Matthew Nelson.” Esther (Paran) Geil checks in: “What have I been doing since I graduated? I found a job, got married, had two sons, worked for 40 years and am now retired from my regular job (which, at its best, involved computer programming). Though my regular job was often a drag, I began teaching adult education and then mathematics as an adjunct faculty member at the local community college about 20 years ago. I love teaching. It is absorbing to try to figure out how to present material to the students so that they ‘get it’ and make it their own. I remember some especially good teachers at Brandeis, including Herbert Marcuse and Abraham Maslow. I treasure good teachers and appreciate good students. Getting older has meant getting pains, which I hate, and some loss of capabilities (a little hearing loss is a nuisance in so many situations, and my eyesight was never great). Maybe I’ve gotten better at dealing with upsets, although I’m still bad enough at it that it’s another nuisance. I’d like to be happy and optimistic all the time. Feel free to share the secret of how to accomplish that. I am not reconciled to dying, or becoming more disabled, or experiencing more pain. These are the big challenges at this age and, along with my ongoing wish to become an optimist, are what I could most benefit from learning to deal with.” Ron Kronish, P’99, sends in news of the birth of his first grandson, Ro’i Yehuda, to Rabbi Dahlia Kronish ’99 and Joshua Maudlin on May 6. The baby was named in a beautiful brit milah and naming ceremony on May 14 at the family’s Conservative synagogue in Riverdale, N.Y. TOGETHER AGAIN: On a recent trip to Florida with her husband, Austin Briggs, Bunny Serlin ’61 caught up with some fellow members of the Class of 1961. 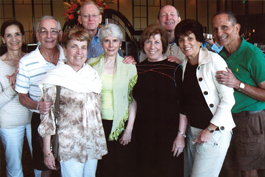 From left: Ronney Kushel Hellinger ’61; Mike and Judy Leavitt Schatz, both ’61, P’87; Austin; Bunny; Adrienne Udis and Joel Rosenblatt, both ’61, P’88; and Sue Biberfeld and Steve Candell, both ’61.